Curly hair is one of our specialties at Lolly G’s Hair Salon in Stuart FL. Salon owner, Laurie Greene, has years of experience working with this hair type and a wealth of professional styling and hair care tips that will help you manage your curls and keep them healthy and beautiful year round. Follow our super tips below! • Curly hair can become tangled very easily. Before and after showering, use your fingers or a flexible wide tooth comb to release any tangles. • Use a gentle moisturizing shampoo. Curly hair loves moisture, and the coarser the hair, the more moisture it needs and the more product it will absorb. 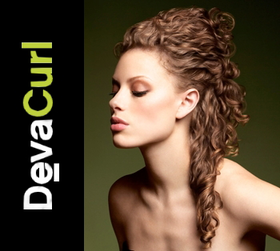 The best shampoo & conditioning products for curly hair are Deva Care or Deva Curl. Deva Care is a gentle cleanser that is enriched with Vitamin C and orange peel extracts to help provide maximum frizz prevention to create healthy bouncy curls. Deva Curl stimulates, hydrates and cleanses the scalp and hair without the use of harsh chemicals restoring and rejuvenating healthy, manageable curls. • When shampooing and towel drying, avoid vigorous motions that can cause your hair to tangle. Never scrub your hair with a towel. Blot your hair gently to prevent it from breaking or tangling. 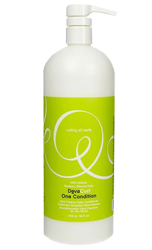 • If your hair tends to be on the dry side, try a leave in conditioning product such as Deva Curl B’Leave-In. This botanically enriched curl volumizer can be used as a hair moisturizer to maintain your hair's vitality and enhance fullness. • For the ultimate intense conditioning treatment, apply Deva Curl One Condition to your curls after an evening shower and allow it to remain in your hair overnight. In the morning, rinse the product from your hair, and enjoy superbly conditioned curls with super softness and manageability. • To help control frizz, apply Deva Curl or Deva Care styling gel or cream to your hair while it is still wet. Depending upon your hair's thickness and density, you will need to apply the product more than once to allow for even distribution. Our stylists recommend applying the product at least 3 times to your hair to ensure that every section has received adequate coverage. • For thin and wavy hair types, avoid applying conditioner to the scalp area. For thicker, coarse hair types, apply conditioner all-over. • Curly hair types dry best without the use of a blow dryer. Whenever possible, allow your hair to air dry. This will keep it shiny and healthy. Make an appointment at Lolly G’s Hair Salon in Stuart FL and discover a personalized salon experience that is customized just for you. We look forward to meeting you soon!